Life After Pitch Wars: Wedding, Napa, Winter Book Launch Party! It's a little over a week since the Agent Round for Pitch Wars began. Eeeep! So what is life after Pitch Wars like? Exactly the same, except I check my inbox more frequently, made a bunch of new friends that I can't wait to meet up with IRL, and am anxious all the time. Ha, I guess it isn't exactly the same then. In any case, I wanted to let you know what I've been up to, what I'm currently reading, and what my next writing project is! This past weekend I flew to Cali for my best friend's (from high school) wedding. It was great seeing everyone and reconnecting with my friends now that we all live in separate states now. Since the wedding wasn't until the evening, Michael and I took advantage of the glorious weather and drove to Napa to do some wine tasting. When we flew back to Seattle the next day, and it was grey and raining still, I was crushed. I need the sun, so I take solace in knowing I'll be back in California for the holidays. Michael contemplating the wine, while I am ecstatic to taste! On the plus side, I went to the WINTER book launch with my writer friend Lisa where we got our hardcover copies signed by Marissa Meyer yesterday (who btw is so bubbly, I'd like to put her in my pocket and bring her everywhere I go when I need a dose of positivity--kidding! But really, she is just the sweetest darling in her ball gown). Q: What was the inspiration behind your Pitch Wars story? Before I get into my answer, I just wanted to say a huge thanks to my fellow mentees, Brianna Shrum (my mentor), and as always Brenda Drake for this incredible experience. I can't believe our journey is coming to an end, but I look forward to 'life after pitch wars' with you all! Now, onto my manuscript, Diamond Queen, a story close to my heart. Diamond Queen was the story I was always meant to write, I just never got down to do it. Inspired by a Vietnamese oral folktale I've heard all my life, I never gave much thought about it until my recent trip to Vietnam this past February where I had heard it again for the millionth time. The folktale is a spin-off from the phrase, "ngu long con chua" or "five princesses of dragons". The phrase is almost always uttered when a person realizes my mother gave birth to five daughters. In the Vietnamese culture, five daughters within a family is considered a sign of good luck. The luck, as I understand, stems from the fact that each daughter is 'blessed' with a certain attribute. Whatever that means. Growing up, the phrase went through one ear and out the other, because I never saw much good luck around us. We were a poor immigrant family with a single parent trying to make ends meet. But when we were in Vietnam this past February and I heard the story again, I made sure to listen. From the awe in my relatives eyes, I realized how far my family had come. My mother raised five girls on her own in an unfamiliar country, sent us all to college (and we now all have stable full-time jobs), and oh yeah, she beat cancer. Maybe there was some luck around us. As a child, observing my family through the hardships, I couldn't see it. But now, I do. Thus the premise of Diamond Queen. Though my story can standalone, it's a planned four-part series about five princesses blessed--or cursed, depending on how you look at it--scattered across the globe who must come together and save their country from tyranny. Diamond Queen is the story of the eldest sister, Avere, who is the heir of a kingdom that wants her dead. I hope one day this manuscript gets into your hands in book form, because I am dying to share this story with you. To close, below are a few photos from my trip mentioned that inspired my imagined country of Vadierra. Check out Vanessa Edward's (fellow mentee and host of the blog hop) blog here to check out more inspiration from the other Pitch Wars mentees! I AM DONNNNNNE WITH LINE-EDITS! It's been awhile, I know. Before I delve into writing, I should probably explain why I've been more silent than usual. This past month I've had to do some follow-up medical testing after my annual exam at the doctor's. Nothing to be alarmed about, but it's always scary to get a phone call from the doctor's office asking if you can do another test, and another test. When I was in high school my mother had cancer, so the doctor's office really gets my anxiety going. My teenage self really thought she was going to die and I'd end up an orphan (not my best high school memories). Thank heavens everything turned out okay. Next month, I'll be going in for another test, yay (heavy sarcasm). But I'm not going to worry about it anymore, since nothing is seriously wrong or life-threatening. Anyway, that's why I haven't been up to blogging. As the title suggests, I've been working on line-edits and I finished yesterday night. I sent in my revised draft to my mentor, Brianna, and I feel weirdly calm about the whole thing. This week Brianna helped me a ton on my pitch and the first 250 words (the entry that's posted) so I'm breathing easier (as long as I don't think about the agent round). Line-edits weren't as bad as I expected, especially towards the last half of my manuscript. The first half ended up needing more work. I need a refresher on grammar rules. After seeing some stupid mistakes I made, I ended up rereading my copy of The Elements Of Style. Some common mistakes? Pronouns (Emperor vs emperor), the word capitol (when the whole time I meant capital), comma usage, dash versus semi-colon, noun matching posessives. SHOW don't TELL mantra. There's always a place where you can improve a part by showing it vividly as opposed to filtering or summarizing. Idiosyncratic details are your friend. Repeating words: and, but, that, just, etc. I could list a ton more, but this is embarrassing enough. It was SO GOOD. The writing and story so beautiful and poignant. I felt like I was reading a narrative through poetry. I annotated my hard copy as I read, and really digested Doerr's writing style. When I finished the book around midnight, I was stunned. Why can't I write like this? Maybe one day. For now, I'll just keep working at it. Besides line-edits, I've been researching my agent list, revising my query and synopsis, and critiquing my CP's manuscript (loving' it so far ;)). In other words, keeping busy! Can't believe the agent round is coming. Eeeeeeppppppp! I'll leave you with some photos of Blaire to make your Thursday a little bit cuter. How has your writing been going? Comment below! YAAAAAASSSSSSS! I turned in my first round of edits in yesterday night to my awesome mentor Brianna and I am both thrilled and nervous! It's also the last day of September! Which is grand, because I love October. I may just have to get a pumpkin latte to celebrate! Anyway, so here's the skinny on my first round of edits. If you missed my first progress post last week, click here. Last time I talked about what I learned about myself in the process, this time I'm going to post about my method for it. First and foremost I gathered all my notes from my edit letter and my video call from Brianna into my handy dandy writing notebook and made a list. The photo below is a simplified list I wrote up, with in depth details on the preceding pages (that I did not post). On the right side of the notebook is a progress log showing which chapters I worked on which day. I'm one of those people that works better in chronological order (gives me a sense of flow). As I write I also tend to jot notes down on a sticky and add them in. My handwriting is pretty messy, but you'll notice that chapters 6, 7, and 12 were chapters that I had to work on for a while. What do they all have in common? They're scenes that has or leads to romantic tension. Yeah, the *feels* are tough for me. Luckily, Brianna sent me some really good articles to read. An article from Roni Loren was included which resulted in me divesting all of her blog posts for writers. I forgot which post it was, but Roni suggested the book below so I ordered it. I found the book to be extremely helpful. It's not something to depend on entirely, but it helps when you get stumped and is pretty easy to navigate, so I recommend it. A read through is a MUST. For me, I loaded my ms onto my Kindle so I could look at it in a different medium. This helps spotting issues you wouldn't otherwise notice. During my read through I was able to read my changes with the rest of the novel in a short span to see if they worked or not. Two of my edits in chapter 4, and of course, 12, did not. So I ended up rewriting those again. But besides that, the ms read better. 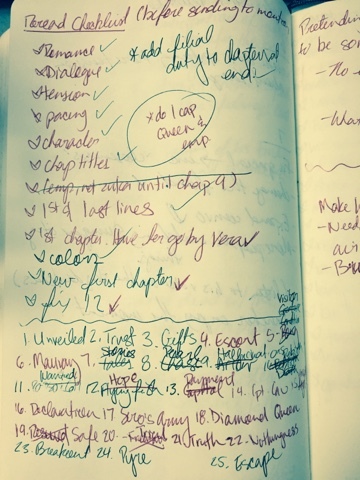 Things not included in my checklist were things like varying sentence structure, word choice, taking out passive voice, renaming chapter titles, and etc, which I changed as I read. My draft is INFINITELY better than the draft I submitted to Pitch Wars. I love that I can see the improvements after having a mentor. My ms is almost there, but I think with a round of line-edits I can get it where it needs to be. Edits are tough though. I was starting to hate the ms because I couldn't get some scenes to work, but after my reread, I fell in love with it all over again. I suffer from bouts of doubt from time to time, but I am also proud of myself and hopeful of where Diamond Queen will go. To end, here is a song that I feel encompasses Diamond Queen. If I imagine the story like a movie, this would be playing at the end credits. An interview, a read through, and some writing inspiration. I cannot believe that it'll be October soon and the Agent Round of Pitch Wars is about 5 weeks away. Eek! If you haven't seen it already, check out my Pitch Wars interview with my amazing mentor Brianna Shrum below! I spent the majority of my weekend working on first round of edits and I finished on Saturday, whoo! So now I'm going to do a quick read through and I'm planning to tweak one of the chapters a little bit more before I turn it in to Brianna. So for now, I've loaded it onto my Kindle and making changes on the computer file whenever I see something that needs to be corrected. I highly recommend you reading your ms in a different medium. It helps point out things you wouldn't normally notice on the computer screen. To end, one of my mentee mates Cindy Baldwin shared a great blog post by Robin LaFevers this weekend with the rest of us so I decided to pass it along. Check out Surviving Nearly There for some writing inspiration! With the cooler weather, it's the perfect time to get cozy, break out the fuzzy socks, sit by the fire, and get back into the groove of writing. This time, however, things are a little different with being in Pitch Wars and all. Being in Pitch Wars is pretty darn awesome. I'm still stunned at finding myself in this position and I intend to enjoy every minute of the process (no matter how much my eyes want to read anything but my ms! I've read it so many times, the words are mushing together--but more on that later). It's been really great connecting with the Pitch Wars community; everyone is so sweet and kind, not to mention extremely talented--it's a great honor to be amongst you all. But what comes after the PW announcements? Hard work. After getting my edit letter and video call from my amazing mentor, Brianna Shrum, I had my list of things to tackle on my MS. It was nice to have some sort of direction going into revision. I went through my MS with my CP and made changes before submitting to PW, but in my gut I knew it wasn't ready yet. Brianna really hit on the nail for me when she explained what my MS needed--which I've realized is one of my weaknesses. None of my edits included major macro changes though, and for that I was pretty happy with because truth be told, I'm not sure if I could handle a huge overhaul in the short time frame. So to you Pitch Warriors cranking out those huge edits, I applaud you. To break down this month and next, I'll be taking the rest of September to revise my manuscript. I'm planning to be done by this Sunday, and then I'll do a read-through on Monday and Tuesday to make sure that all the changes are cohesive. Then off to my mentor on the 30th, where I wait for line-edits! As I wait, I'll work on my pitch, query, and do some agent research on who I'd like to query outside of the contest when it's over. Sounds pretty peachy, but how am I doing exactly? Well, the edits were harder than I thought they'd be (aren't they always?). I really only did heavy changes to one chapter so far, but I feel like I'm being hyper critical when I read my manuscript that I'm going at a snail's pace, second guessing every single word choice. I am driving myself mad I tell ya. Because I feel like I'm doing something, but when I look at my track changes, it looks like I haven't done much at all. The story looks the same (plot-wise), but I am hoping it *feels* different. Hopefully when I do the reread and I'm reading it on my kindle versus MS word, I'll feel better. The gut twinge - This happens when I read something in my MS and I instantly hate it. This tells me that it can be written better, but I don't know exactly how. It just feels off, so I tweak and tweak, hoping it solves the problem. Rearranging & transitioning - When you rearrange paragraphs within a chapter, you lose the initial flow, so you have to revise so the flow in the chapter works, but also with the whole of the book. This is actually much harder than it sounds and probably contributes to me feeling like I'm doing nothing. Bad eggs in the carton - Some chapters are really great, and then there are others that aren't so much. But you can't just toss that bad egg out, or in this case, the chapter. You need it to make a dozen. So you patch it up and try to make it work, but it still doesn't look whole. The yolk is oozing from the cracks. Chapter 12, I'm looking at you. Digging deep - Since plot is there in the MS, I'm focusing on building up the emotion throughout the novel. Considering I'm an emotional person since I cry at basically everything, you'd think that'd be a breeze. But it's difficult bringing the emotions of characters to life without being melodramatic. You teeter between that fine line, and you don't want to tip over the edge. This is probably the best polished manuscript I've written (and within a small time frame too, whoo!). After doing major tweaking on one of the chapters, I think my pacing is right on! No insta-love BS in this manuscript, which I take as a compliment, because looking back on M2, I could have built the romance part better knowing what I know now. This book's more hooky than M2, which I think will make it more commercially viable. I'm making significant progress in novel writing from when I began in Fall 2013. What happens after Pitch Wars announcements. 1. You pinch yourself until you get bruises because this is all so surreal and you can't believe you actually made it. 2. You declare your love for your mentor and Brenda Drake because really, this would not be possible without them and then you celebrate by drinking a bottle of wine with your fiancé while you try to keep up on twitter and text messages filled with congratulations. 3. You get to know other Pitch Wars mentees and you get tossed into this really cool support system that will be there for you while you go on this journey (all the while you're thinking, oh em gee, the talent here is amaze-balls. Am I sure I'm in the right place?). 4. EDIT LETTER. You read it like ten times, hugging it to your chest because the words are like diamonds! Gem-sized nuggets that will really make your manuscript shine! Suddenly it's like you found your writing fairy godmother and you can't help but look forward to the ball (or in this case, the agent round). 5. But then you remember you don't have the best outfit (aka your manuscript still hasn't reached it's full potential) so you get down to work and sew yourself the best darn gown you can. 6. Oh, but wait. You are a total newb at sewing so you video call your writing fairy godmother to go over the stitching and how to approach it (aka discuss the edit letter and make a game plan). I am currently heading into stage six as I compile my list of questions for my mentor. I also squeezed in a vacation between stages 4 and 5 so this week has been just a whirlwind of AWESOMENESS. *pinches myself* Is this still real life?